THE CYPRUS ‘trapped buyers’/’hidden mortgage’ law enables property buyers to get the Title Deeds for the property they purchased despite the fact that their transfer was blocked because their developer was either unwilling or unable to settle his relevant debts. However some problems remain – in particular who pays for the work necessary to enable Title Deeds to be issued. Daniel Dalton, MEP for the West Midlands tried to get clarification on this particular issue from the European Commission. With reference to Directive (EU) 2015/1208, adopted by the Council in July 2015, there appear to be a number of issues with British citizens being unable to obtain Title Deeds from the Land Registry in Cyprus in respect of an unfinished resort. These problems are occurring for a number of reasons outside of the Land Registry’s control: the developer has not paid for a building permit, planning permission for the resort has not been renewed by the developer, and the developer has not completed the exterior works of the resort such as pavements and roads. I understand that once a Certificate of Final Completion is issued, the Title Deeds are released. However, in this circumstance the residents have paid for the completion of a resort that is not eligible for Title Deeds, and therefore cannot obtain legal ownership. Although the Commission has assisted some owners, many others are experiencing problems. Could the Commission confirm whether or not in its view these residents will be liable for the costs of completion if the Land Registry issues the Title Deeds for the resort? The Commission has paid special attention to the issuance of outstanding Title Deeds and their subsequent swift transfer. According to the information available to the Commission, for properties bought before 2015, where the buyer has completed his contractual obligations and filed a corresponding request, transfers require only the issuance of a Title Deed, upon a certificate of final approval with no major violations of building and planning permits. In case of such violations, titles may sometimes be issued, but are ineligible for transfer to buyers until the violations are rectified. Recent reforms seem to have widened the range of minor deviations tolerated from building and planning permits. In principle, liability for the rectification of non-tolerated deviations rests with the title holder, subject to confirmation by the relevant national authorities. The distribution and recourse of related expenses between buyers and sellers could likely depend on the specificities of the property purchase contracts between them. Within the programme, Title Deed issuance and transfer legal uncertainties have been reduced. However, some uncertainty remains, in particular, pertaining to developments with planning permit violations. Under the scope of EU surveillance and technical assistance, the Commission continues to focus on the matter in cooperation with the Cypriot authorities. However, the resolution of specific cases remains fully within the realm and under the responsibility of Cypriot authorities and courts. Daniel Dalton is a former cricketer and a Conservative Party politician in the United Kingdom who has been a Member of the European Parliament since January 2015. @Scruffy – The problems here in Cyprus is obtaining a clean final approval certificate. Once you have this your 99% there in applying to the LR for titles. We had just better hope that the British Government (what’s left of it), takes it’s time in invoking Article 50, because as soon as they do, all issues and promises relating to our non EU properties will be dropped like a hot brick by the EU. Even though we are led to believe that not much will happen over the first 2yrs or so, I am guessing they will be in no hurry to force anything through. This will suit the Cypriot LR just fine as any pressure on them to solve any problems will quickly evaporate. I know that there are many Cypriots in the same situation but the chances are, they will suddenly be catapulted to the front of the queue. 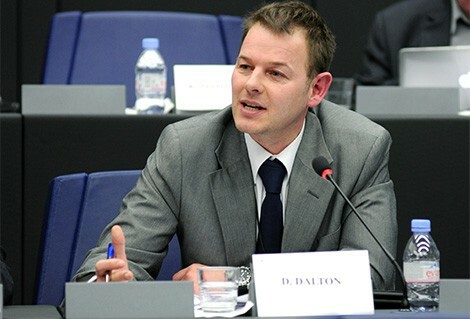 Good to read about West Midlands MEP Daniel Dalton’s question to the EC. However, Mr Moscovici’s answer displays the continuing failure of the EC to address the remaining Title Deeds problems. His answer – the responsibility to complete a resort lies with the Title Deed holder, is simplistic. At the moment, in our case, this is the developer and not us, because the developer refuses to complete our resort, for which he has been paid in full. This developer has gone on to construct other buildings, so no lack of funds, just the will or motivation to do the right thing. So when the Developer and the Cypriot Government does nothing what then Mr Moscovici? We have been in this position since 2007! We are not alone. Taking Mr Moscovici’s answer on behalf of the EC, I would ask Mr Moscovici the following additional questions. Please confirm that as a result of the EU Surveillance and Technical assistance given to the Cypriot Authorities over a period of several years, (presumably leading to the recent decree), will this support now result in the prospect of ‘Tainted’ Title Deeds being issued to some owners, where a resort is incomplete. If this is correct, how is this progress? How does this outcome protect consumer rights? If the above is correct, will these owners, rather than their Developers, then be responsible for completing their resort, due to the continuing failure of Developers and Cypriot Authorities to undertake their legal responsibilities over several years to rectify, for example, fundamental Planning and Building Permit violations? Is my understanding correct? If so, how can this be legally and morally justifiable? You failed to answer Mr Dalton’s question on this point. If these statements prove to be correct, then solutions can only lie in the hands of the Cypriot Government, the EC and the Developers. Not individual owners. With the greatest respect to Mr Moscovici, I think it is time the EC Cabinet Commissioner for Justice, Consumers and Gender Equality, Vera Jourova provides answers to these specific questions, justifying the answers provided. I would then be confident that Vera Jourova is actually aware of the continuing Cypriot Title Deeds problems. At the moment the evidence suggests this particular EC ‘Department’ continues year after year to fail a significant number of consumers in Cyprus. This Department fails by not insisting, through the existing ‘open infringement proceedings’ against the Cypriot Government, that the Directive on Unfair Commercial Practices; the Directive on Misleading Comparative Advertising and the Directive on Unfair Terms in Consumer Contracts are enforced promptly. Even when successful, as in our case against our Developer through the CCPS for ‘unfair terms’ in our Contract of Sale, the case has not yet been taken up by the Cypriot Law Office, some twelve months after the ruling in our favour was reached. Thanks for this latest info from EU. This particular issue is under discussion with Pegeia Council, Land Registry & Leptos Harbour Shore Estates (Coral Bay Estate). Leptos has not done the required works on the estate (green areas, public road access for all houses, street lighting, pavements) Pegeia has been under heavy, heavy pressure from Land Registry Nicosia for several years to issue the Completion Certificates for the individual plots (288 of them). Pegeia has been stalling due to Leptos plans to build next to Coral Bay beach & this issue of who will pay for the required works still to be done (which Leptos refuses to do). We’re moving along with the process but Pegeia’s latest stall was to get yet another legal opinion as to who is responsible for the costs when they issue the completion certificates, which will all have annotations on them due to the illegalities. This is due for discussion at next Pegeia Council meeting but it seems the legal opinion says that Pegeia is responsible to pay for the costs. How to recover these either from the property buyers or the developer is quite another matter & apparently there is no legal precedent – yet. What happens if you have paid the house off but the developer owes a small portion of the land and the transfer from the original owner needs to be made to the developer and then the developer to the owner? How do we go about getting our title deeds in this case? The contract of sale was submitted to the appropriate department at the time of the sale some 6-7 years ago? 1. The landowner and the developer have an antiparochi (Î±Î½Ï„Î¹Ï€Î±ÏÎ¿Ï‡Î®) agreement whereby the landowner provides land to the developer in exchange for a number of properties from those being built. In this case you will be unable to get the deeds until the developer has fulfilled his obligations to the landowner. 2. The developer purchased the land from the landowner but has encroached onto ‘other’ land. In this case you will be able to get the deeds, but you will be unable to sell or transfer the property until the encroachment issue has been resolved – i.e. by the developer (or you) will have to pay for the extra land.